“Inclusive Fitness: Working With Individuals With Disabilities in the Community” will be held from 8 a.m. to 5 p.m. Feb. 11 in Rooms 105 and 177 in Daemen’s Academic and Wellness Center at 4433 Main St., Amherst. The “train the trainer” program is open to experienced and new fitness professionals, and all participants will receive a certificate of completion at the conclusion of the program. Certified participants who complete the one-day program will be eligible for National Strength and Conditioning Association approved CEUs. Designed to provide an overview on developing inclusive wellness and fitness services, the program will discuss disability awareness, modifying exercises for individuals with disabilities, exercise and nutrition, relaxation and yoga, universal design at fitness facilities, and marketing an inclusive fitness program. Sessions will be taught nurse practitioners, physical therapists, athletic trainers, and fitness instructors. 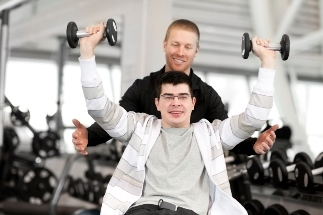 Daemen’s inclusive fitness program is a part of a two-phase project, “Get Movin’ – Exercise, Nutrition and Wellness: A Fitness Initiative for Individuals With Disabilities,” being funded by a $50,000 Inclusive Fitness Field-Related Grant from the New York State Developmental Disabilities Council. Overseeing the project are Dr. Diane Ryan, associate professor of nursing, and Dr. Theresa Kolodziej, director of clinical education in physical therapy. To register or for more information, contact Theresa Kolodziej at 839-8412 or email tkolodzi@daemen.edu, or register online.